OK, so, we have a deal. Singletrack want a second Pretty Sweet, mostly because they are nice like that. As such we are going to try and make one for them, and I reckon I'll try and blog a bit about the experience. We have a few plans afoot but for now, we'll post a few stories from 2010, and the accumulation of footage so far. So, what ended up being our first 'shots in the bag' day was a sweltering ride in July. My overiding memories of it now are of major chaffage issues and Dave W pulling of some tech riding miracles. 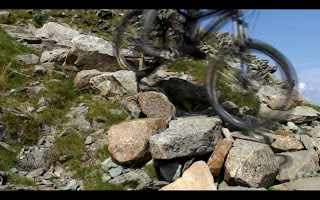 I think we are all keen to get some 'Fell tech' shots into the film as gnarly, but slow, trails are a firm favourite and hence Dave and I headed to the top of High Street with this in mind. After a quick nap upon reaching the summit we set of towards Nan Beild with a few shots in mind. The Big Gnar Staircases favoured by fix the fells featured, and whilst I pottered down on a hardtail, the ginger one made things look much smoother. Probably due to the suspension and huge fork he is now lugging round the hills on top of the skills he had anyway. Taking the radios made filming much easier, and the reduction in shouting at each other TO GO was nice. Bleep when your ready kids. After a few shots on the staircases to the West of Nan Bield we headed over to the east side where things kicked up a notch. No staircases or obvious lines on this side of the pass. I was off form but Dave W picked out some gnadgery lines for the camera, and whilst a few didn't go, the majority of lines and shots came out pretty nicely. A few hikers impressed (really should get that on camera one day), we headed homewards. And this meant riding Nan Bield. Whilst not as full on as the north side, the south of the pass is the classic, allthough a bit flat to make look good on camera, singletrack,. As good as it is, we were having issues. No idea what happened but the chafe was horrendous. Heat, sweat, summat else? Who knows. All I know is when I got home I nearly burn't my riding shorts. Bastards.